?Take a self-guided Hop-On Hop-Off tour which will give you plenty of opportunity to experience as much of the Robertson Wine Valley as possible. ?From popular locations to hidden gems, take your pick and create your own adventure. Hop-off at your preferred destinations. If you wish to move on to the next location hop-on, if not, stay as long as you like. 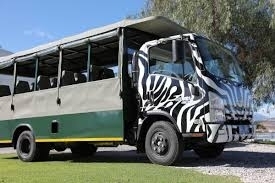 The open-air safari vehicle will circle the route, in one direction, every hour until its final pick-up round, before the estates close from 15:00. 6 Wine Estates ; 1 Breede River Cruise? ?WHERE DO I HOP ON? For groups of 6 and more, a pick-up at your accommodation in town (Robertson and Montagu) can be arranged. Group transfers from other locations such as Mosselbay, Swellendam, Worcester and Cape Town can be arranged. Contact us for a quote. ?Please be ready 15 minutes prior to pick-up. McGregor is a unique, eccentric and therapeutic village away from the crowds where you can truly unwind, step back in time and just relax. ?Start the day with an MCC tasting at Paul René, enjoy lunch in the Village and take a stroll through McGregor's local craft shops and galleries. We continue with a drive up to the mountain to enjoy a wine tasting at Lord’s Winery, followed with a tasting at McGregor Wines. If time allows, we end the day with a Grappa tasting at the Tanagra Private Cellar. WHERE DO I HOP ON? An entertaining and educational day tour that will enrich your understanding and appreciation for the unique art of wine making, to discover the story inside the bottle. This guided tour showcase some of the most unique and must-do activities at 5 wine estates in the Robertson Wine Valley. ?Start the day with an exclusive terroir and cellar tour by an exceptionally passionate winemaker that will give you a good understanding of the wine-making process. We move on to a boutique wine estate where you will experience an interactive tasting in a unique underground candlelit ‘kuip’ that include; a vertical wine tasting of single vineyard limited release wines, comparing normal wine glasses to grape specific crystal glasses (RIEDEL), pairing wine with fruit preserves, chocolate, music and art. Followed by a picnic-style lunch on a relaxing boat cruise down the Breede River. Discover the inner-winemaker in you, by blending, bottling and labeling your very own wine creation to take home, as memorabilia of the wonderful day you have had. We end the day at South Africa's biggest family owned winery, for a great variety of wine and food pairings platters to select from. Regrettably, no refunds or discounts are given for non-attendees. CONTACT US FOR A SPECIAL PACKAGE TO SUIT YOUR NEEDS! We have a good idea of activities that operate on Sunday's and can create a special package for groups of 8 and more. 1. Birds Paradise OR if a wine and food pairing platter is more what you fancy, we will take you to @FourCousins. 2. Continue your Sunday cruise to Graham Beck where you will taste world class MCC. 3. End the day with a craft beer tasting and lunch at Saggy Stone OR alternatively, enjoy a 3-course Sunday lunch on a lazy boat cruise down the Breede River.